I’ve examined the possible location of the Land of Oz and its surrounding fairylands in the past. To sum up, the earlier books seem to place it in some hidden part of our Earth, while more recent ones tend to regard it as more of an alternate world connected to ours. There have been suggestions that it’s physically on a different planet, and what’s particularly odd is that the earliest of these appears to have been written by L. Frank Baum himself, or at least with his approval, and quite early on in his writing about the magical land. 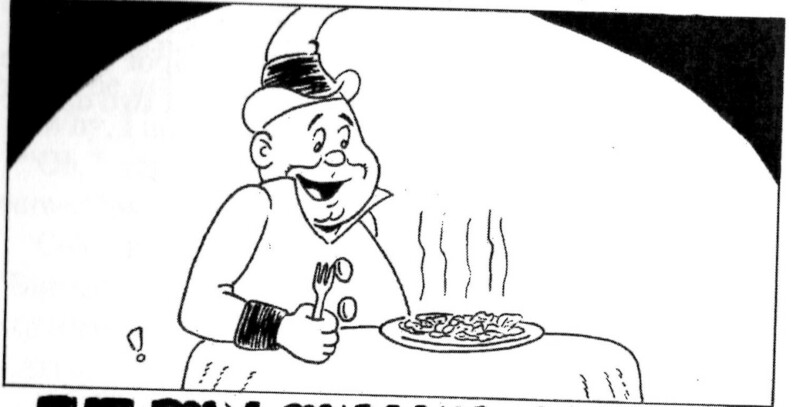 In the promotional material for the Queer Visitors from the Marvelous Land of Oz comic pages, there are descriptions of the Gump flying to Earth by way of several celestial bodies, starting with a planet near the constellation Argo, then one orbiting Polaris, another in Ursa Minor, and Uranus, Neptune, Saturn, Jupiter, and Mars. What’s more, it rarely takes more than a day to get from one to the other. Each of these worlds is inhabited, and there are some rather fanciful descriptions of the inhabitants, yet they’re still familiar with Earthly animals. In Argo, the Gump is sighted by Professors Swoggleman and Nindon, both astronomers. Horses there are called coramans and camels smokdaughs, and Swoggleman has invented a device that lets him view any part of the planet’s sky. At Polaris, the Gump circles the city of Tarnia and lands on Mount Haldon. King Hoodman orders an attack, but 20,000 of his soldiers desert him out of fear. There’s also apparently a bad witch of the north living there. The Gump causes destruction in Ursa Minor, and there’s no indication as to whether Ozma helps the inhabitants rebuild. Uranus is inhabited by beings one-hundredth the size of the Gump (who, you may remember, is formed largely of two sofas), and ruled by Queen Nell XLIII. Uranus’ ruler is King Kala, and there’s a witch of the south on the planet. Jupiter is led by a President, its people are only half the size of the Ozites, and the government has an airship called Constellation. According to the Ozmapolitan, the visitors are entertained there by a mayor, perhaps of the city of Dabin. The Martians actually recognize the Ozites, and the King receives them as guests. The Ozites also visit the University of Mars, where the Scarecrow and Tin Woodman assist with a signal-based visual system of interplanetary communication. There’s even an indication that the world on which Oz is located is flat, although this is contradicted with the Tube in Tik-Tok. Interestingly, Baum’s novel The Master Key has the Demon of Electricity report that there are no people on Mars, although some of the planets in the solar system have “low orders of beasts.” Tik-Tok informs Dorothy in Ozma of Oz that Mr. Tinker, one of the people who built him, rested a ladder on the Moon and then went to live there, pulling the ladder up after him. James Howe’s Mister Tinker has him return, although he accidentally ends up in Kansas rather than Ev. 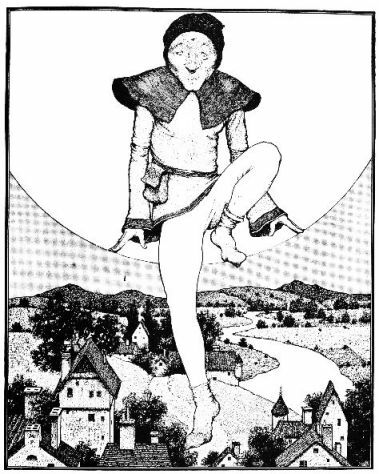 “The Man in the Moon,” one of Baum’s Mother Goose in Prose tales, has the titular Man slide down to Norwich on a moonbeam, then return back home in a balloon. 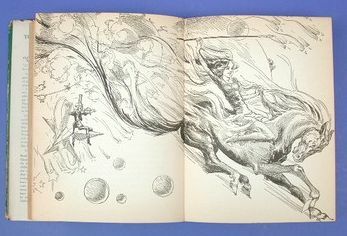 Although Baum and his successors did occasionally incorporate science fiction elements into their work, their take on space travel tended to be a more whimsical one, with such issues as gravity, breathing, and temperature not really taken into account. I don’t think there’s any scientific way to explain a ladder or balloon to the Moon, a flying thing with palm leaf wings mastering interstellar flight, or a flying bus being wrecked on a day star. There does seem to be some indication that stars in fairyland are not exactly like ours, with some being solid objects and others living beings. That doesn’t mean the stars we know aren’t also visible from Oz, though. What’s trickier is taking the planets into account. Small stars within the atmosphere are one thing, but do the Nonestic lands have their own Moon and Mars as well? I suppose it’s possible. It’s also worth noting that a giant crab on Sky Island claims to be the constellation Cancer fallen out of the Zodiac, and Gina Wickwar’s Hidden Prince presents the Big Dipper as a physical object in the sky above Oz. And it’s never entirely clear where Anuther Planet is located. Later authors have certainly tried to tie in the Ozian versions of celestial bodies with the real ones. Chris Dulabone’s Three-Headed Elvis Clone Found in Flying Saucer Over Oz has the same Man in the Moon as in Mother Goose in Prose, but he mentions having hidden from astronauts. While that might not be the most valid source, that’s sort of the same approach I used in my story “From Oz to the Moon,” in that I kept some of the silly aspects but also acknowledged the lower gravity and that humans would normally not be able to breathe there. At least Ruth Plumly Thompson firmly locates Stratovania within the atmosphere, and the flesh-and-blood visitors require pills made by the Wizard of Oz in order to breathe properly there. I suppose the Scarecrow, Tin Woodman, Jack Pumpkinhead, the Sawhorse, and the Gump have no need to breathe; and maybe the Wogglebug has the ability to go into a state where he doesn’t require air or something. And the Man in the Moon seems to be a fairy of sorts, so I doubt the normal rules apply to him. Kass Stone’s Martian Invasion reports that Mars at the time of the tale is under the control of King Phnayunkelphno II, leader of the Second Great Martian Empire. His people are originally from the Ughish Islands of Saturn, but they conquered Mars some time ago, and have turned their sights to Oz. I don’t know whether this is the same king who would have greeted the visitors in the Gump. A few Oz books utilize the theme of space travel. In Yellow Knight, Speedy’s Uncle Billy has built a rocketship that he plans to take to Mars, and this is in a book published in 1930. It ends up burning through the ground instead, taking Speedy to Subterranea; but Uncle Billy begins work on another one soon afterwards. Kenneth Baum’s Dinamonster has the boy Tripp visit Oz in a rocket plane that his father built. Jam in Hidden Valley was originally going to get to Oz in a rocket, but was told that the publishers had already rejected another Oz manuscript that used a rocketship, which was probably Dinamonster. And Yankee had an American dog launched into space, his capsule landing in Oz. Later works have had Ozites travel in space. It’s pretty much a logical progression of a series that had already taken its characters underground, underwater, and to the sky; but the fact that we don’t really know whether Oz is on Earth muddles the matter a bit. This entry was posted in Characters, Chris Dulabone, Gina Wickwar, L. Frank Baum, Oz, Oz Authors, Places, Rachel Cosgrove Payes, Ruth Plumly Thompson and tagged anuther planet, argo, big dipper, cancer, demon of electricity, gump, james howe, jupiter, kass stone, kenneth gage baum, man in the moon, mars, mister tinker in oz, moon, mother goose in prose, neptune, ozma of oz, ozmapolitan, polaris, professor wogglebug, queer visitors from the marvelous land of oz, saturn, scarecrow, sky island, smith and tinker, speedy, stars, stratovania, the dinamonster of oz, the hidden prince of oz, the hidden valley of oz, the man in the moon, the martian invasion of oz, the master key, the silver princess in oz, the yellow knight of oz, three-headed elvis clone found in flying saucer over oz, tik-tok of oz, tin woodman, uranus, ursa minor, yankee in oz, zodiac. Bookmark the permalink.